FANCHEST Reviews - Great Sports Memorabilia? Fanchest is a sports memorabilia company that promises to make giving gifts to sports fans easier than ever with curated collections of exclusive, licensed gear and apparel. For the mega sports fans in your life, Fanchest promises to be the perfect gift giving option by providing you with a curated gift box of licensed sports gear for the team of your choice. The company states that its ‘chests’ are an easy gift solution for all sports fans and that they provide premium quality fan gear and a satisfaction guarantee for every purchase. According to the company representative we spoke with, Fanchest was founded in 2015 by Jeff and Dan- two huge sports fans who spent eight months looking at market research to determine how they could build a company that better served the sports community. They believed there was a market gap for women who wanted to buy sports gifts for men, so they established Fanchest to meet that need. Today, the company stats show that 75% of their customers are women. 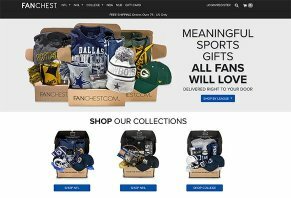 Does Fanchest offer value for sports fans, or is it better to go in a different gift-giving direction? This article should help you make sense of Fanchest. At the time of writing, Fanchest is a one-time purchase (not a subscription) company that sells collections of surprise sports-related merchandise for use as gifts or personal use. The company states that each standard Fanchest contains between four and six products associated with a specific sports team. Their website says that they typically reveal one or more items within each box and that the rest is meant to be a surprise- though you can request to know the details beforehand by contacting customer service. Fanchest told us that they work with over 100 vendors to source exclusive, high-quality products for each chest. The company representative we spoke with told us that half the products they offer aren’t available anywhere else, and that they plan to make that number 100 percent within two years. The Fanchest’s website states that the contents within each chest are guaranteed to have a higher retail value than what you pay and that they only provide premium, officially licensed products within them. What Kind of Merchandise Comes in a Fanchest Delivery? According to their website, the company offers a variety of buying options for personalizing your team and chest variety. Customers can choose their crate based on their favorite NHL, NFL, College, NBA, MLB teams. The categories of merchandise at the time of writing included adult, signed memorabilia, baby, youth, and themed (tailgate, golf, etc.). All customers who buy the same chest will receive the same products, and Fanchest changes the merchandise within them every April and October. According to the brand’s FAQ’s, the objects that their chests contain may include apparel (T-shirts and sweatshirts) headwear, licensed merchandise, fan gear, and a Fanchest golden ticket. While the contents of each box will change over time, the company guarantees every order that asks for a T-shirt size will come with a shirt. Some teams also offer the option to purchase specialized chests with jerseys, sweatshirts, and other non-T-shirt apparel items. What is the Fanchest Golden Ticket? Each Fanchest order comes with a ‘golden ticket,’ which the company compares to a scratch-off lottery ticket. Each ticket gives subscribers the chance to win VIP game tickets, signed memorabilia, and discounts off future orders. The company says you can determine what you won based on the word found on your ticket. Customers who receive BALLIN, CHA-CHING, #WINNING, or WOOP WOOP should email sales@fanchest.com with the ticket’s 5-digit code. Tickets that say CRUSHIN, YAHTZEE, C-YA or OH YEAH are connected to future order discounts and can be used like any other promo code. Of the online reviews we looked at, all customer’s golden tickets won 10% off future orders with their ticket. How Much Does Fanchest Cost? Our research into Fanchest pricing showed that the standard boxes start at $59.99, plus shipping. The pricing Fanchests with signed memorabila varied by team, but most were between $145 and $225. There was a range in pricing for other chest options at the time of writing, and some teams were on sale for less than $39. Fanchest offers a variety of shipping options, including FedEx ($5.99 per order), USPS Priority ($9.99) 2-day ($18.99) and overnight ($29.99). All orders over $75 ship free with FedEx. What is the Fanchest Return and Refund Policy? According to the company’s FAQ, Fanchest is happy to offer exchanges for all sizes that don’t fit, so long as the tags are left intact. They also promise to provide a full refund to anyone unhappy with their purchase. You can contact the company directly to deal with product issues at sales@fanchest.com or through their Facebook page. What Do Previous Customers Think of Fanchest? Are sports fans satisfied with the swag they receive from Fanchest? We looked at previous customer reviews to get a better idea. According to articles on Business Insider and hockey-focused Icethetics.co, the quality of the contents within their Fanchest boxes were impressive and that they totaled a higher price point than the cost of the box. Both reviews were especially positive about the t-shirt quality, as it was 47 brand, a premium sportswear company. One thing that the Icethetics reviewer noted about his gear was that the included novelty coin had the wrong date printed on it (it said that the Lightning franchise was established in 1991 instead of the real year, 1992). This made him suspect that it was a misprint and likely not as valuable as the company stated. Even so, he calculated his chest’s value at $98, significantly higher than the $60 he paid. The reviews we read on Fanchest’s Facebook page told a different story. The brand had dozens of comments on its posts from customers saying that they were disappointed in the quality of the products they received because they thought the box would contain most of what was pictured on the website, which is more than the promised 5-7 products. Many of these Facebook reviews showed that the customers believed they could buy the same gear less expensively in most sports stores. A few also mentioned that they never received the gift wrapping, correct T-shirt size, or even signed memorabilia that they paid extra for. We also noticed some reviews from people saying that customer service was hard to contact and didn’t return their calls, emails or Facebook messages. This didn’t match our experience, as Fanchest was quick to get in touch with us to answer our questions. What Companies are Similar to Fanchest? Are there other options for buying sports memorabilia as a gift? We looked at Sports Crate, one of the biggest rivals to Fanchest, to find out. Note: Numerous other sports memorabilia companies that popped up in our searches – My GameDay Box, Football Haul Company, and Game Day Crate – were not in operation at the time of writing. Shipping Costs $5.99-$29.99 (free for orders over $75). $5 (free for orders over $50). Comparing these two sports memorabilia companies, the most significant difference that stands out between them is that Fanchest is a single-purchase company, while Sports Crate is only available on a subscription basis. Customers have the option to sign up for a bi-monthly subscription billed every other month, a three-crate subscription billed twice a year, or a six-crate subscription billed yearly. Pricewise, you’ll pay less for Sports Crate, especially if you commit to a six- or twelve-month subscription. Both companies estimate the retail value of the merchandise within each crate to be $20 more than their price point, but since Sports Crate costs half as much as Fanchest, you'll save $30 per delivery while still receiving 4-5 items. Another difference between the two companies is that Fanchest offers a broader range of sports teams, including NHL, NFL, and college teams. This gives the brand a greater chance of having the team you’re looking for, though we did notice that some teams were completely sold out at the time of writing, likely because of the holiday season. Apparel-wise, Fanchest promises to provide a T-shirt in every crate that requests a size preference, while we didn’t see any equivalent guarantee from Sports Crate. Another point of differentiation is that Fanchest’s FAQs state that they accept returns and honor refund requests, while Sports Crate specifies that they don’t. Which brand is better? We think your decision should come down to whether you want to purchase a one-time gift or sign up for a subscription. You’ll pay more for Fanchest upfront than Sports Crate, but it’s still a better deal if you don’t want to commit to reoccurring orders. Our View of Fanchest: Does the Company Make Sense for You? While researching the facts behind Fanchest, we discovered that this company offers an innovative gift idea for sports fanatics. The brand’s representative told us that Fanchest’s target demographic is women shopping for gifts for their favorite men, and this is consistent with who we saw leaving reviews of the product online. Speaking of reviews, it’s hard to ignore some of the negativity surrounding Fanchest on their Facebook page. We read dozens of complaints from customers who were left unsatisfied with the number and quality of the products within their orders, and some that stated that they received the wrong sizes or were missing items. The reviews we read off Facebook were significantly more positive, and they gave us a sense that customers found their crates to be a good value because they offered top quality apparel and officially licensed gear. Fanchest also offers the broadest range of sports and teams of the brands we looked at, though many options were sold out at the time of writing. Overall, we think Fanchest looks like it could be a good option for sports enthusiasts- so long as your preferred team is available. You won’t need to commit to more than one purchase, and the company promises to refund any unhappy customers. Write a Review for FANCHEST!